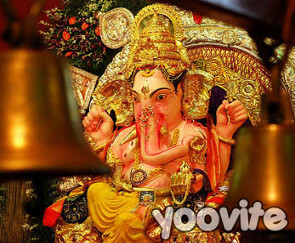 Ganesh Chathurthi is the celebration of the rebirth of Lord Ganesha. The celebrations last for around 5 to 10 days in most parts of India. Better still, the preparations start one month earlier. Mostly Ganesh Chaturthi celebration includes lots of pujas, fasting, chanting and singing which is later concluded with immersing the Ganesh idol into the sea. 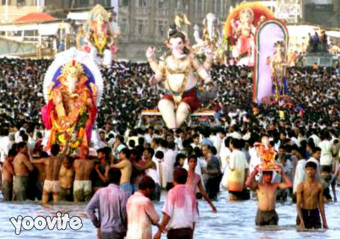 The Visarjan or the immersion is when the idol is immersed into the sea, lake or ocean. The ritual actually depicts the return of Lord Ganesha to the heavens until next Ganesh Chaturthi. Most of the devotees also carry aarti lights, sing praises to God and do pujas alongside the water body. The traditional food for the festival of Ganesh Chaturthi is also very important. It is always vegetarian and the most important dish would be the sweet called “modak” which is believed to be Lord Ganesha’s favorite too. The cuisine varies according to the part of the country. Howvere, some of the most popular dishes that are prepared during this festival are Besan Ke Ladoo, Kaju Ke Barfi, Karanji, Motichoor Ke Ladoo, Puliyodarai, Puran Poli, Rawa Ladoo and Moong Dal Ka Halwa. There are also gifts exchanged during this festival season. The most common present is the Ganesh idols for Ganesh Chaturthi. There are also plenty of Ganesha wall hangings available in the market today. There are also Ganesh Chathurthi gift hampers that would include almost everything that would be suited for the festive season. To invite everyone, you can use free online invitations like yoovite, which is so much more easier and economical than paper invitations.